Bring a bit of class into your dining room with the Elizabeth collection. Made from luxurious European Beech and stained with a satin Walnut Veneer finish, this dining table has a distinct air of refinement and retro charm. This table is pure quality. Constructed from premium European Beech or American Oak, each Elizabeth table is stress tested to ensure top quality construction for many years of use. Walnut is a fantastic, versatile colour that fits into any home. Our Walnut and Oak veneers have a luxurious satin finish and great colour - rich and warm, it suits almost any space. Looking for somewhere to sit? Explore our extensive range of bestselling dining chairs, available in a variety of popular colours and prints. 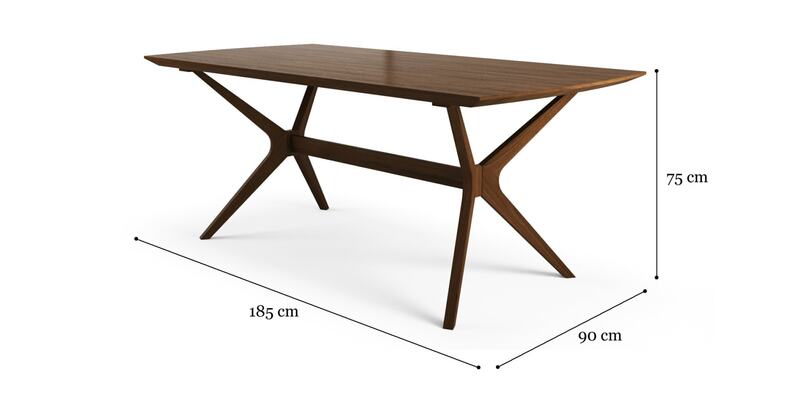 We're really happy with our Elizabeth dining table. Colour is beautiful, its really solid too. I think we'll be adding more of the Elizabeth collection to our home very soon. Can't recommend it more!